How much does it cost to travel to County Donegal? How much money will you need in County Donegal? 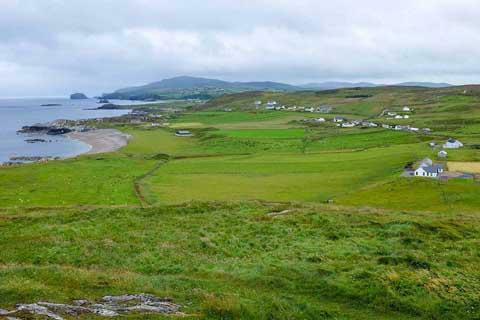 €58 ($66) is the average daily price for traveling in County Donegal. The average price of food for one day is €12 ($14). The average price of a hotel for a couple is €84 ($94). Additional pricing is in the table below. These average travel prices have been collected from other travelers to help you plan your own travel budget. How expensive is County Donegal? Bordering the Atlantic Ocean on Northern Ireland's northwestern perimeter, County Donegal is a largely Irish-speaking region known for its castles, rugged coastline, and scenic mountain landscape. Until around 1600, the area was largely controlled by the O'Donnel clan, one of Ireland's richest and most powerful Gaelic ruling families. Their base was located in what is now Donegal Town at Donegal Castle, which still stands today. Like many areas on the western seaboard of Ireland, Donegal has a world renowned fiddle tradition with songs featuring a distinctive sound that can be heard in just about any village pub. It also has a long literary tradition, beautiful wool textiles, and a largely Catholic population. One of the most popular attractions of County Donegal is Glenveagh National Park. It is the second largest national park in Ireland, covering about 170 square kilometers of mountains, raised boglands, lakes, and woodlands. Glenveagh Castle is an architectural highlight of the park, a 19th century castellated mansion crafted from local granite. Its construction in a remote mountain setting was inspired by the Victorian idyll of a romantic highland retreat, and its preserved condition offers a glimpse of a lifestyle belonging to another age. Visitors can take guided tours of the castle. Another important castle of the region is Donegal Castle, located in Donegal Town. As mentioned earlier, it was an important fortress of the O'Donnel clan, has since been restored, and is open to the public for touring and Gaelic cultural events. Most of the other sites of Donegal County consist of striking natural features. The Slieve League, for example, is a mountain on the Atlantic coast that has some of the highest sea cliffs on the island of Ireland, reaching heights of up to 600 meters. Malin Head is the most northerly point of Ireland, located on the Inishowen Peninsula of County Donegal. This point where the land meets the sea is said to be breathtaking, wild and rugged with plenty of wildlife and an interesting wartime history. As far as the rest of the countryside goes, County Donegal is full of rolling mountains, scenic lakes, and beautiful waterfalls. Donegal Town, home to Donegal Castle, is the place that gives County Donegal its name. It is a quaint town with a handful of pubs and inns, and offers easy access to sandy beaches as well as hiking in the nearby Bluestack Mountains. While the pubs do have some nightly traditional entertainment, a better selection of shops and social amenities can be found in other nearby towns. Letterkenny, for example, is the largest and most populous urban settlement in County Donegal. The town boasts a movie theater, annual music festivals, as well as a lively nightlife with many bars, pubs, and clubs to choose from. If you seek more of a quaint, but bustling village, Ardara is becoming more and more popular with visitors. There has been some recent growth with pubs and shops featuring local crafts made from woolas it is the woolen center of County Donegal. There is also a weaving museum, plus music, dance, and art festivals throughout the year. Bundoran is the most southerly town in County Donegal. A popular seaside resort, the town caters primarily to tourism with a large selection of inns, pubs, and local activities. Being home to so many natural wonders, County Donegal is a hub for visitors looking to experience the outdoors of Ireland's unique landscape. From seaside cliffs and crashing waves to rolling mountains, sweeping green valleys, waterfalls, glens, and lakes, County Donegal is full of opportunity for the outdoor explorer. Glenveagh National Park with a wilderness of its own has become a haunt for many interesting plants and animals. You might catch sight of some along any of the park's marked trails, from pleasant walks to mountainous hillwalking. If you find yourself further north, on the Inishowen Peninsula, a walk to the 40-foot Glenevin Waterfall is also well-worth the journey. Beyond exploring the unarguable natural beauty, a visit to any of the towns and villages of County Donegal will offer up another range of activities. From souvenir shopping for local crafts like woolen tapestries, blankets, and rugs, to hopping pubs, museums, galleries, and local life, each town of County Donegal is its own little hub of culture. Some of the best activity can be found in popular seaside resort town of Bundoran, as well as Donegal Town and Letterkenny. As far as history goes, a place like Glencolmcille Folk Village sits as a thatched-roof replica of a rural village, down to the details of period furniture and artifacts. Designed, built and maintained by the local people, the Folk Village is one of Ireland's best living-history museums. Doagh Famine Village, on the other hand, offers another kind of historical experience with guided tours that take visitors through a journey of Ireland's struggles from the great famine up until present day. Many are familiar with the traditional Irish favorites beef and Guinness stew, shepherd's pie, bangers and mash, fish and chips, corned beef and cabbagethe list goes on. Plus, one cannot miss some of the domestic brews like Smithwicks, Guinness, and Harp. Northern Ireland, however, also has some of its own unique cuisine, the best known traditional dish being the Ulster fry. It is a breakfast dish prepared with griddle breads like soda bread and potato which are fried until crisp and golden and served with Bacon, sausages, an egg, a tomato and sometimes mushrooms or pancakes. Pubs, of course, are a staple anywhere in Ireland, most featuring nightly entertainment of traditional Irish tunes. The main airport of the region is Donegal Airport, located on the west coast. Flights operate twice daily all year round from Donegal to Dublin Airport, with a schedule four times weekly from Donegal to Glasgow International Airport. Letterkenny is the largest city in County Donegal. The Bus Eireann Travel Centre in Letterkenny provides bus service to Derry, Dublin, Galway, and many other locations. See their website for schedule details. Being a fairly rural and large county, the easiest way to navigate the area is by car. Renting a vehicle offers much convenience to see what you want to see with easier access to the more rural towns, and no grueling bus rides.